People who have driven across our vast country appreciate the diversity of the landscape and the multiplicity of settings. 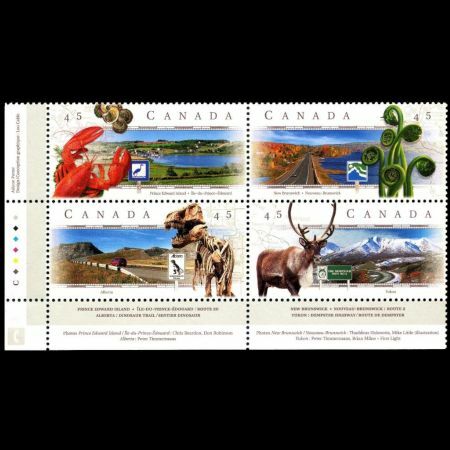 The second instalment in the three-year Scenic Highways series captures four different Canadian panoramic scenes from four of our picturesque provinces and territories: Prince Edward Island, New Brunswick, Alberta and Yukon. A 48-kilometre loop around the Red Deer River west of Drumheller, Alberta's Dinosaur Trail takes motorists on a fascinating trip through the fossil-rich badlands of the Valley of the Dinosaurs, a vast prehistoric graveyard. Dr. J.B. Tyrrell of the Geological Survey of Canada first uncovered the dinosaur beds near Drumheller. His 1884 discovery of a petrified dinosaur head sparked a fossil search since dubbed the great Canadian dinosaur rush of 1909-1917. The Tyrrell Museum of Palaeontology, Canada's only institute exclusively devoted to exhibitions and study of prehistoric life, was established in this area in 1985. 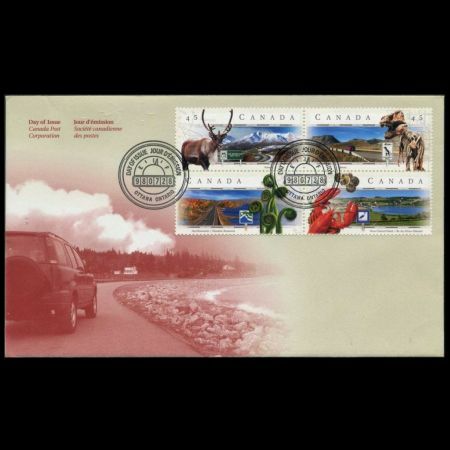 The 1998 Scenic Highways stamp series offers a dynamic blend of photography and illustration. 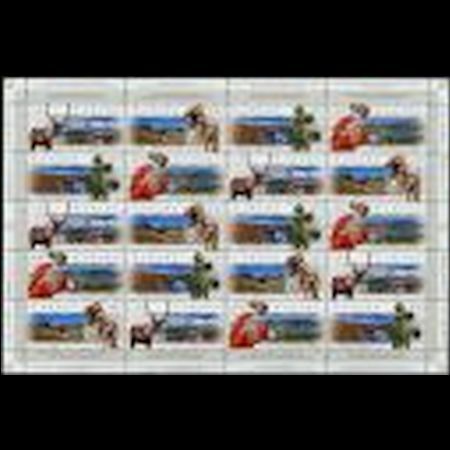 "Acquiring the panoramic images was the most challenging part of the project", said the stamp designer Lou Cable. "After sending photographers across vast distances at the mercy of Mother Nature, we certainly appreciate the massive size, geological contrast and climatic range of our country. This is never more evident than in this year's stamps." 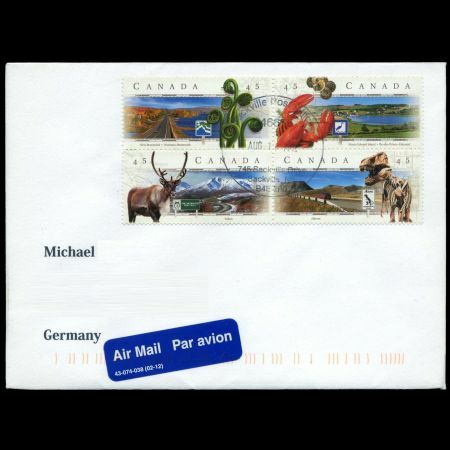 The series will be issued July 28 in Ottawa, Ontario.